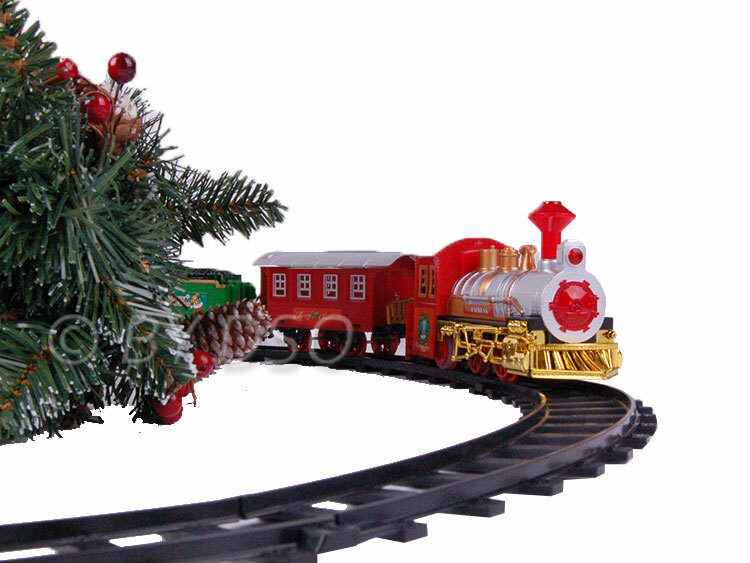 Delivering its promise of magic and delight is the Christmas train set. Santa's Christmas train will delight young and old alike, and is sure to become a festive favourite. The animated engine car comes with a headlight and realistic engine sound with which your passengers will be transported on a magical holiday adventure aboard the Christmas Express! It's a spectacular Christmas decoration, build the set around the base of your Christmas tree or use as a moving centre piece on a table. Can be assembled as a circle or an oblong simply by adding extra track pieces. Can also be assembled on the floor for year round fun. For indoor use only. Not suitable for children under 36 months as it contains small parts which can present a choking hazard, and some components have functional sharp points and edges. Handle with care. This product was added to our catalog on Wednesday 19 November, 2014.